● Read : Tech Facts #02 Here..
● Read : Tech Facts #03 Here.. Here the #04 Facts about begging of Computer. 1. Google did not create Android, they bought the company in 2005. 2. 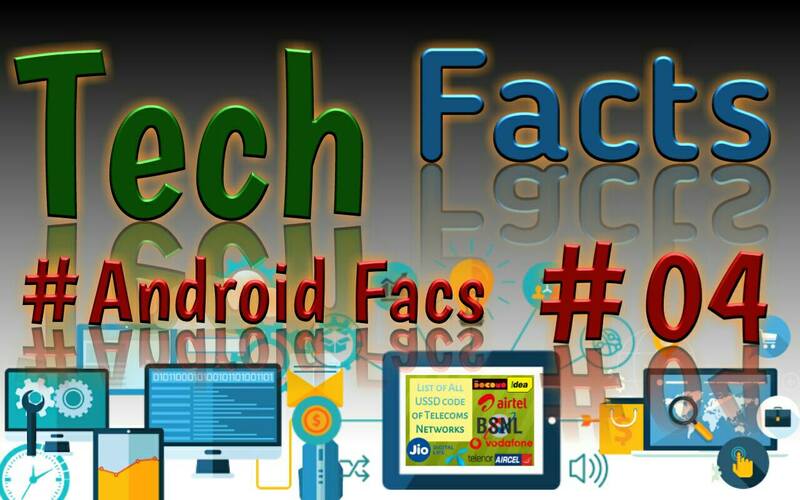 Android was originally created as an operating system for digital cameras. 3. It is based on the open source operating system Linux. 4. It controls 88% of the world smartphone market. 5. The first Android prototype looked a lot like a Blackberry. 6. Microsoft makes an astounding $2 billion a year from Android in the form of patent royalties. 7. Over 1.4 billion people are now using Android. 8. Samsung had the opportunity to buy Android in late 2004 but passed the opportunity because they did not see any potential in it. 9. In 2007, when Android was unveiled, Nokia made a statement “we don’t see this as a threat”. 10. The word Android refers only to a male robot, whereas a female robot is called “Gynoid”. 11. Google has statues outside its HQ for each version of the Android OS. 12. Apart from Android 1.0 and 1.1, all other Android versions have been named after sweet treats or desserts. Below are the names of various Android versions. 14. The very first Android phone from 2008 had no headphone jack and required an adapter. 15. In 2010, Anssi Vanjoki, CEO of Nokia, said that using Android is like a Finnish boy peeing his pants to stay warm. 16. Google Maps calculates traffic by tracking how fast Android devices are moving on the road. 17. Android Logging System has a method called wtf() which stands for “What a Terrible Failure”. 18. Android devices sell more than Microsoft Windows, iOS, and Mac OS X devices combined. 19. In each Android version, an Easter egg can be revealed by continuously clicking the version number in the “About” screen. 20. In late 2008, many critics thought Android would fail miserably.